Exit 3 Aldgate East Tube Station. 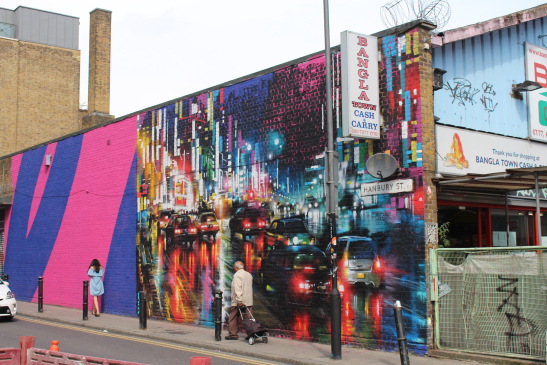 I met up with artist Clare Qualmann outside Exit 3 Aldgate East Tube Station. 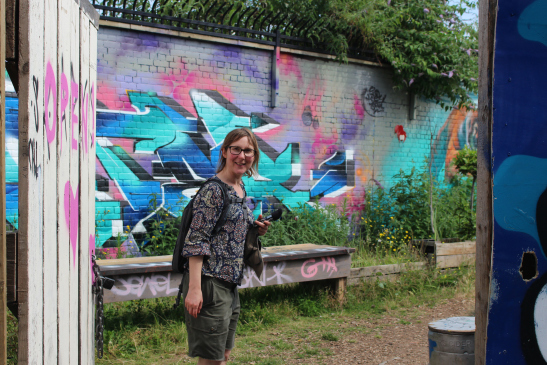 We walked to Toynbee arts/café space where Clare talked me through the walk. A multi-media performance/walking artist and a senior lecturer in performing arts at the University of East London. Clare is also a founding member of the international Walking Artist’s network. 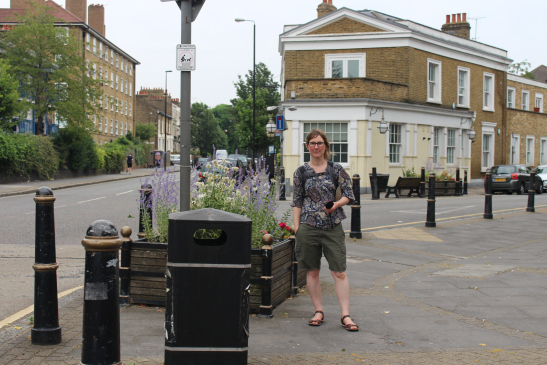 Clare had planned our walk from Aldgate East to Stratford Olympic Village, following the route of her walkwalkwalk project’s infamous night walks. So we are in Aldgate just on the eastern edge of the city of London and I’ve chosen to start here because it feels like this is the border between the city and the East End and coincidentally or perhaps not, it’s also the start of the walkwalkwalk route. walkwalkwalk was a project that I worked on really intensively for six years with Gail Burton and Serena Korda and it was a walking project that explored our routine walks. From its outset, the goal was to re-explore the places that we are familiar with, or that fell on our routine pathways. But as the project developed we realised it had this kind of side effect of tracking some changes that were happening in the city and at that time there were some really significant shifts going on as the East London Line extension was coming right through. The map I’ve got here shows the walkwalkwalk route and the East London Line extension that went right through the middle of it making a really enormous change. We’re going to walk part of that route today. When we used to lead people on this route as a night walk we used to do it as a circular walk but today we’re going to do one part of it. So we’re starting near Aldgate East tube and we’re going to walk around to Old Castle Street where the building that used to be the Women’s Library, which is part of London Metropolitan University is, and then we’re going to wiggle our way through Brick Lane, up past the old Shoreditch Station and then through Bethnal Green and then when we get to the end of what was the walkwalkwalk route we’re going to carry on east and we’re going to walk across or around the edge of Victoria Park and then on. 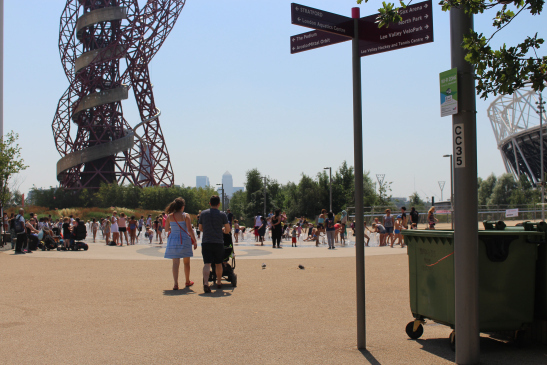 And the reason I want to do that is because that will take us to the London 2012 Olympic zone which is another really important site of borders and boundaries and edges and a highly contested space. Clare tells me that the walk tracks her biography and that walkwalkwalk stopped making live work in 2010. Our last collective walk was in 2010 and in 2010. I also got a new job at the University of East London which was taking me and my routes further east; and so this walk reflects that now I mostly work in Stratford, which is on the other side of the Olympic Park, but from 2007 this entire zone that surrounded the Olympic Park was closed to the public and it was surrounded by an enormous blue fence. 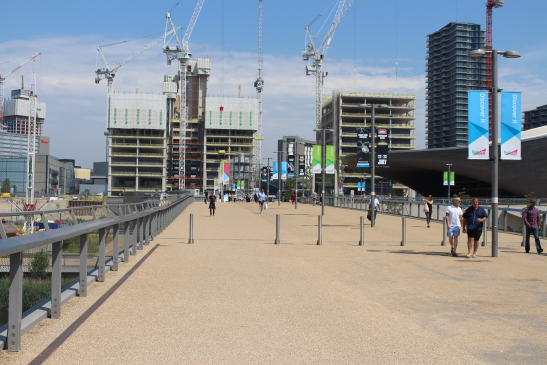 The reason given was the risk of terrorism, and they couldn’t possibly safely complete the construction work for the Olympic Park without closing this enormous chunk of land. I know there was this great rhetoric from the organisers about this being wasteland, about there being nothing here, but of course, there was stuff here. There were car yards and scrap yards and allotments and marshland and cardboard box places and storage places and churches, industrial units and nightclubs and also routes from one place to another. 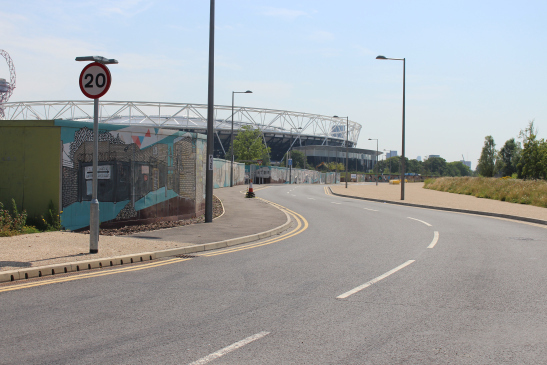 When it was closed, if people living in Leyton or in Stratford wanted to get to Hackney Wick, which is maybe less than half a mile away, they had to do a two-mile loop to get to where they were going. The imposition and impact of this shut off parcel of land was really enormous. It’s open now so we’ll be able to see it and many parts of it are fantastic, there are really beautiful bits of the park, but it has been a contested chunk of landscape. Before we set off on our walk, I asked Clare why walking became such a central part of her arts practice? Well, that really ties into where we are on this first map. I got a job at London Metropolitan, it was then London Guildhall University at their Art School, just slightly off the map here in 1999 and I was living at the time in Bethnal Green, probably about two miles away, and I didn’t have any money and I had to walk to get to work. I had to walk to get everywhere, it wasn’t just walking to save money, it was a necessity as my budget didn’t allow for paying for transport. I couldn’t afford a bicycle. It only took half an hour, it’s not that extreme a walk, but it was a walk of necessity. And then I met Gail Burton who was in a similar position to me, so both quite recently had left Art School, we were doing part-time jobs and trying to maintain an art practice as well trying to work out how we were going to be artists. 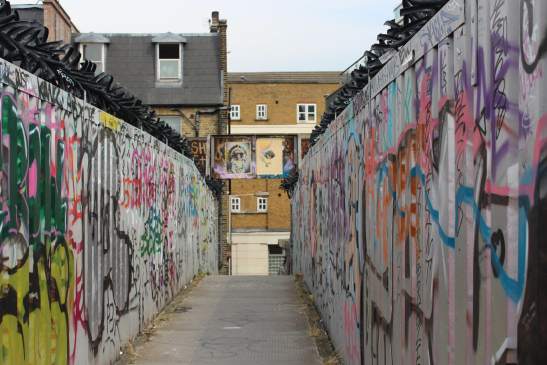 We were sharing a studio that was really near where I was working and she was living in a different part of Bethnal Green, so between us, we had these really well trodden shared routes, and then we met Serena. Gail and Serena had some work in an exhibition together and it felt like this really common thread between us, these necessary walks, quite long walks that trod the same territory and from that I suppose we were also feeling like it was very difficult to make art and show it. We were trying to work out how the commercial, or even how the artist-run world of the East End, works for an outsider or for a newcomer. It was quite challenging and so we felt quite inspired to try and make something that we could just do without a gallery or without permission, without funding, without any kind of infrastructure. A walk really felt like, well anyone can go for a walk – you know the streets are for everyone aren’t they, we can just do it and we can invite people and then it will exist, and then I guess through the repetition of it, it grew and grew. I tell Clare I was really inspired by her night walks, of women taking space, using space but also in going against the grain, and the way the walks connect to women’s citizenship too. Yes, and we were really struck when we first started walking at night, even before we invited big groups of people to come with us, by how the fact that we were not just on our way somewhere, changed the way we felt in a space. So when we were just exploring at night and walking these routes at night as part of the project I think we all shared feelings of anxiety about unpromising looking dark alleyways, yet when we did some fly-posting – using stories that we’d written from encounters along the walk and putting them back onto the route, it changed the way we felt. Fly-posting is ubiquitous here so it doesn’t feel that transgressive, it is a little bit, but the main thing is it’s a shift in mentality or psychology of your behaviour within the space, and through that process, really claiming it and feeling safe and I think once you repeat that and nothing bad happens you really do start to feel safe and that you have a right to the space. Sharing that with other people is really empowering too, with women and men. Actually, that really felt like a very important part of the project; and on the way, we’ll see some of the spaces that we made use of. I say: that is wonderful, it really connects for me with women I have walked with who are ‘out of place’ and marginalised, and also the broader history of women in public space, thinking about Gwen John’s paintings of interior spaces, in contrast to her brothers. There was a really lovely passage from Virginia Woolf that somebody read on Dee’s Walk at the weekend which was about needing an excuse to go and wander across the city but that the excuse, needing a pencil, might be all she needed to be allowed to go and wander, but still needing that excuse, that there must be a reason for a woman to be out walking. Yes and in current times, with Brexit especially, I am thinking of the migrant mums and girls that we have been working with here in London, but also in other parts of the country in the North East, how it feels to be in those spaces and what spaces are OK and what spaces are not. What I love about the night walks is they transgresses and disrupt this, by women taking ownership of space. The first time we shared the walkwalkwalk route was actually at a conference that one of my colleagues organised, it was kind of a baptism by fire because to start off the art project at a conference where there were a lot of academics asking us hard questions [laughs] it was really good, I think we did fine but, I don’t know, I’m not sure if that’s kind of what shaped or pushed me towards a more ‘practice as research’ model. It was definitely an interesting audience to have for the first outing of a project you know. 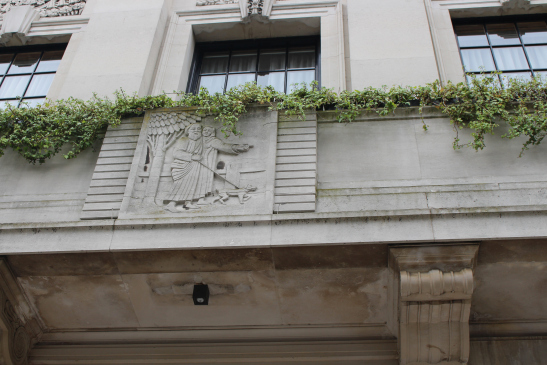 This is the facade of the Goulston Street Baths and Washhouses which were built as a model establishment by the campaigners for the Public Baths and Washhouses Act. They built it to demonstrate to parliament that it was a good thing, because there were lots of arguments against baths and washhouses being built as public institutions, not least that they would provide space for women to talk to each other and so it’s appropriate that this facade then has the new building which was the Women’s Library behind it, which was a fantastic archive now moved to the LSE. 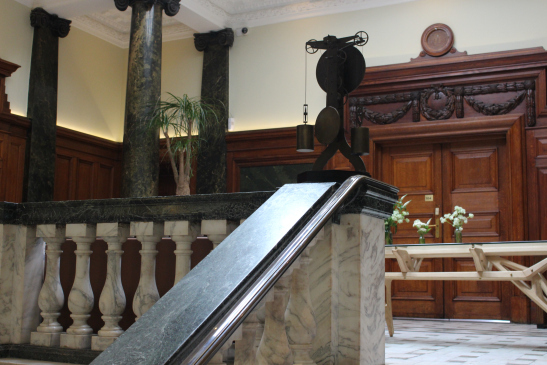 It is extraordinary because it was the Fawcett Library’s collection that formed the basis for the Women’s Library. The Fawcett was the organisation that campaigned for Women’s suffrage, alongside the Suffragette Movement and they have an amazing collection of the Suffragettes banners from their marches, so it wasn’t just a paper archive, and there was custom built display space for the banners, you could handle them. Anyway, it’s one of London Met’s disasters to close this. I wanted to start here because it’s on the walkwalkwalk route but it’s also the starting point of a walk I did call Spinning Stories which came out of a residency at the Women’s Library. The residency was about baths and washhouses and laundrettes and the places people talk to each other but also quite specifically about gossip and about women and about the connections between laundry, for example in idioms like ‘airing your dirty linen in public’. And a safe space for women and a space of ‘women’s work’. The architecture is beautiful. I know, it’s Heritage Lottery Funded and inside it’s beautiful too. The Reading Rooms are by Wright and Wright the architects, specialists in library design, and it’s just stunning you know wooden panelling and really, really a beautifully designed space. And all we can hear standing here is the sound of construction. We talked about the sounds of regeneration, the construction of luxury flats and offices that are replacing older buildings and Clare said ‘you can feel the wave coming.’Here at the fringe, border and edge of the city, Clare pointed out the tower blocks taking over the spaces that are visually more mixed and lovely, the legacy of Victorian and gothic London. 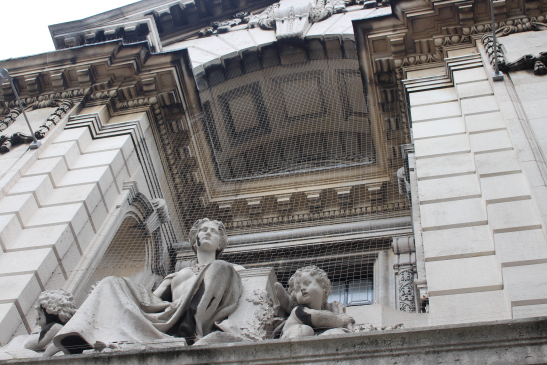 Clare said that London Metropolitan University had just sold the glass-fronted arts school building we were looking at. We looked across at the glass tower block, currently a university building, and both felt a sense of sadness, seeing it sold off to capital for office use. We both wondered why the management team would sell a freehold building for 50 million to lease another building. As surely there are more creative possibilities? 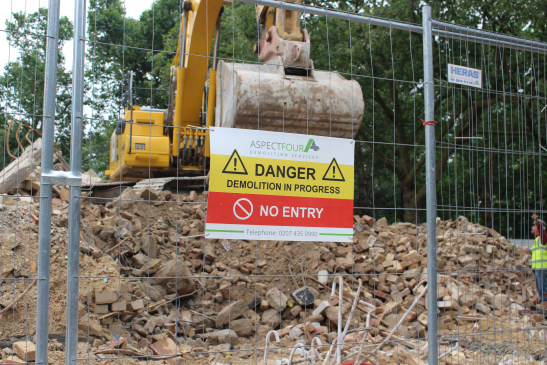 Our walk was to be marked by the sounds of construction and ‘feeling the wave’ in the relationship between space, capital, dwelling and the diversity of life in city spaces; the dominance of the wave or pulse of construction and the chink of money, money, money. 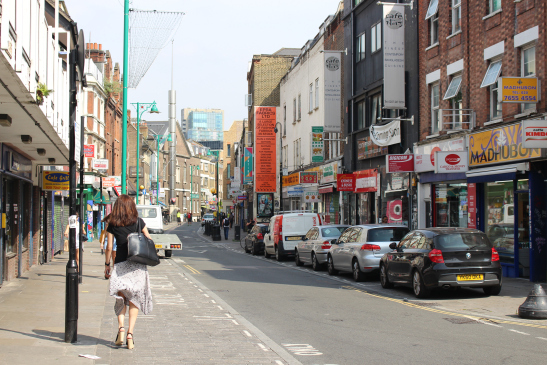 So we’re going to go up Brick Lane a little way but we’re not going to stay on it for too long and we always discuss this on our night walks that we’d steer clear of Brick Lane as much as we could because we’d lose people to the bars and the restaurants. Yes, it’s very quiet isn’t it, obviously, it’s morning and the first part of the day, it’ll be heaving later on. The sensory experience walking along is fabulous though isn’t it. The gorgeous wafts of spices? 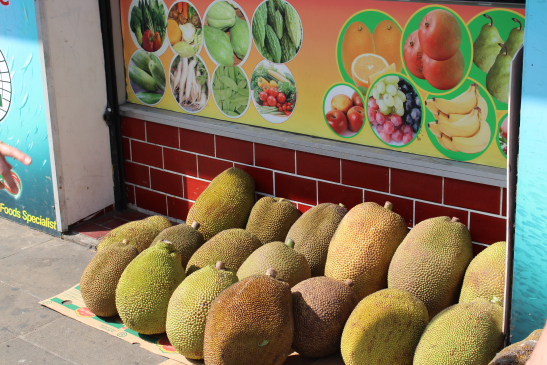 Yes, it’s great isn’t it, are those Jackfruit? I think they’re called Jackfruit. Aren’t they wonderful, it’s such a feast. 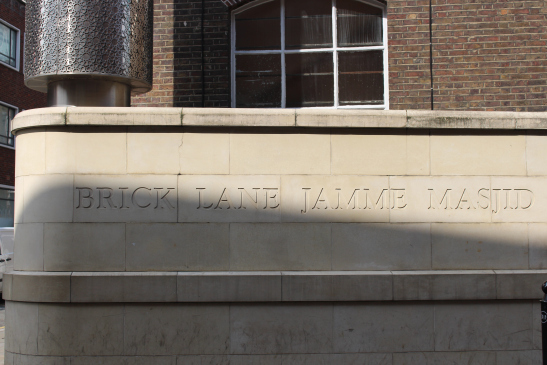 So actually you can’t walk down Brick Lane without somebody pointing this out to you because it’s a symbol of the waves of immigration and migration that have come through this part of London. This is a mosque now but it was built as a Huguenot Chapel I believe, and also served as a synagogue in the late 19th and early 20th century. The Huguenots, the Protestants who were expelled from France in the 17th century, settled in this part of London and actually if you just look down this street here you can see these were the houses they built, with their weaving studios in the attics to maximise the light – they were silk weavers – very skilled craftsmen. The pogroms in Eastern Europe in the 19th century led to waves of Jewish migration and these houses then were converted into flats, or just rooms rented to families and Brick Lane became almost entirely Jewish, and then that wave of migration shifted as people moved to North London and established themselves, then there were Bengali and Somali waves of migration in the 20th century that came to this area too. It is very much an area of arrivals and departures. We talked about the layers of history in the buildings and streets and Clare told me about a post-colonialism walk she did with her students here. Walking along Princelet Street: the street of Travel Agents and money transfers. We walk past lovely Victorian houses, that were possibly local authority or housing association flats because they all had the same coloured front door. It has been turned into small units for new media businesses, you can see it’s really great inside. I have a friend of a friend who’s got an office space there, it’s kind of thick with plants and these kinds of curvy glass cubicles, really interesting workspaces. Yes and look, Travel Agents side-by-side. Regent and Al-Quibla, three side-by-side. It’s interesting, isn’t it? Well, how would you choose which one to go to? Oh and another one, Aerospace Travel Agents. Wow! So Princelet Street is the street of Travel Agents. Money transfers as well, Argo Money Transfers. A wheelchair user passed us as we were standing looking at the building and Clare told me about an AHRC funded project Dee Heddon and Sue Porter from Bristol did about walking with wheelchair users called Walking Interconnections. And they did an audio walk which was really great, really, really interesting about the kind of resilience and the acceptance by people when there’s no dropped kerb. 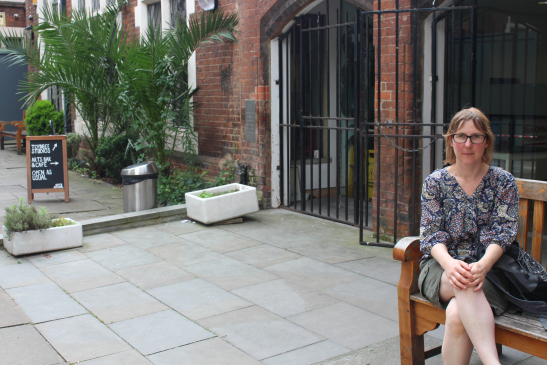 It came out of a research process where they were grouping wheelchair users with environmental activists and talking about shared ideas around resilience, how disabled people’s embodied knowledge can contribute to the sustainability debate. 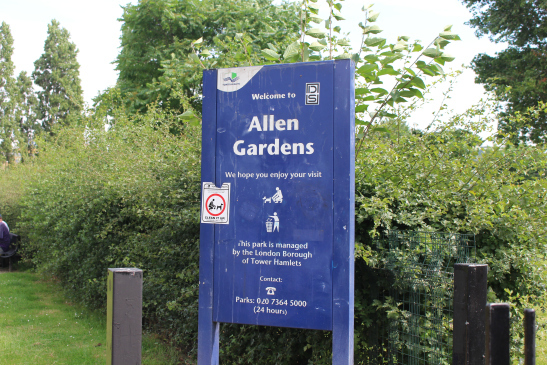 We had arrived at Allen Gardens. So this was one of our nighttime fear zones when we first started doing the night walks. Yes, it’s quite a, well it’s quite a kind of, cut-off space. It’s busier now than it used to be because everything’s got busier, and there’s more nightlife in the surrounding streets and that kind of makes it feel safer. But because there are no through roads it is cut off. There’s just one I think that goes through to Brick Lane, but you’ve got this railway line, and then just on the other side there’s another railway line which kind of cuts it off even more. I noted that there are no lampposts, no streetlights here. There is a line of streetlights along the new railway line now, but that wasn’t there, so this is a very dark space. 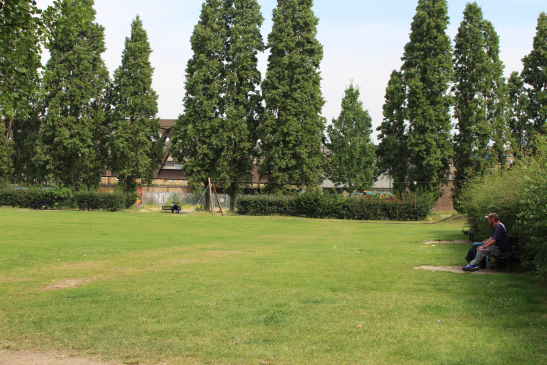 It is also a big space with trees at the edge that adds to the sense of a cut off border space, protected by the trees. It feels isolated though it’s quite well used by street drinkers. 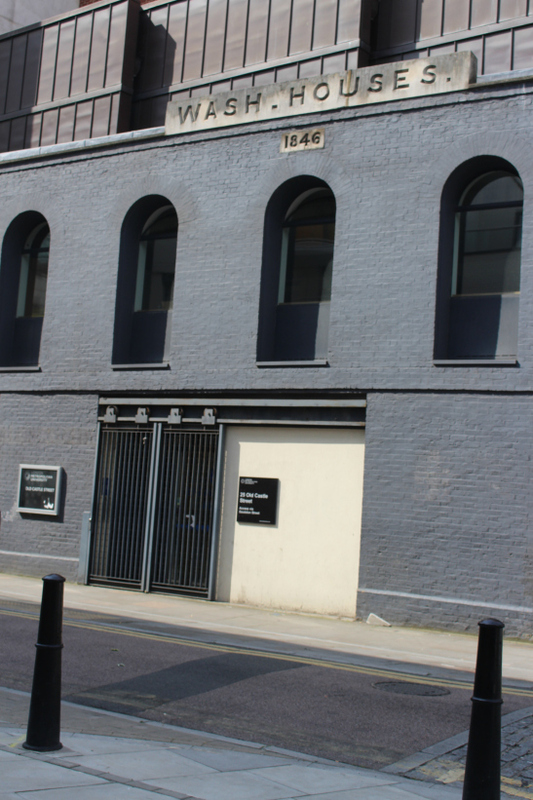 So this little building over here was the old Shoreditch Station and that’s where the East London Line used to terminate, but it used to stay below ground level. It wasn’t completely underground in a tunnel but in a cutting. This raised line that we can see in front of us is new, part of the extension. 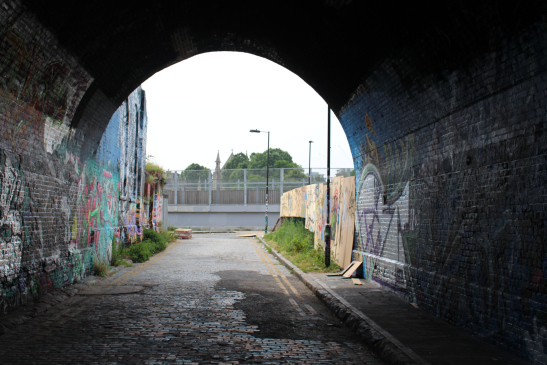 The street drinkers used to hang out on the corner there with a brazier and it felt like a bit of a gateway into this disused, or underused space. And then if we go through here you’ll see how space really is well used now. 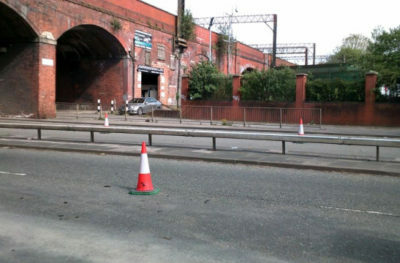 This in-between space is kind of forgotten, it’s cut off between the railway line, and an accident of the city’s development. But while this was being built which probably took three years this whole area was closed off – or the access to it changed on a regular basis. And again, similar to the rhetoric about the Olympic Park, it was said ‘oh well there’s nothing there it’s just an empty space, why would anybody mind if you couldn’t walk through or get around’ but it meant that the people who lived in this block of flats, Weaver’s House, their routes to get to and from, Brick Lane or to Vallance Road on the other side was blocked, changed or diverted. At one point there were hoardings that made kind of tunnels, walkway tunnels around, and you felt like you were in a rat run trying to get through. 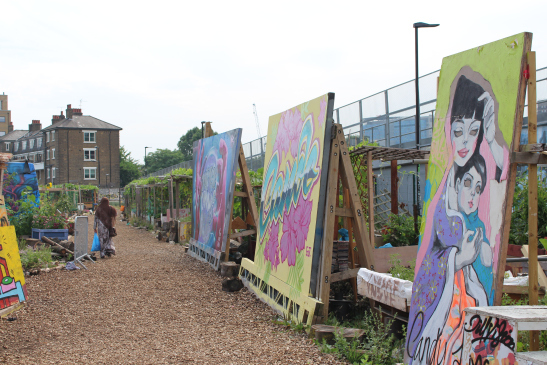 We arrived at the Nomadic community gardens, a wonderful space between the two train lines, a lovely convivial space and seeing people working on their gardens was wonderful. Yes, it’s so lovely. 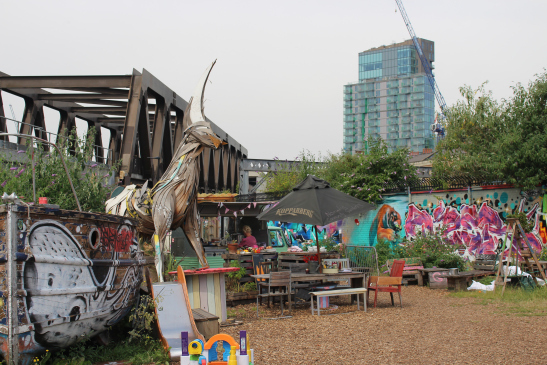 So this space was a wood yard and a scrap yard with a gate at the other end, a closed-off space, and then for ages, it was just empty and fenced off; and then I assume there was some kind of permission process, but now it’s fantastic, it’s become this. 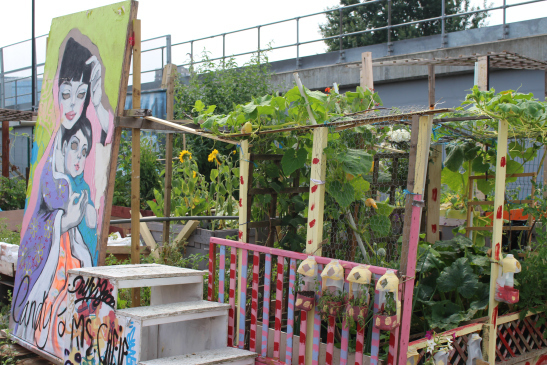 This wonderful little chunk of allotments and community activity. And also a public space as well, a meeting space? Yes, the seating yes and toilets over there. So I think so things like this feel really exciting, and an amazing way for the city to develop. I just hope it’s not like a placeholder until they can work out how to build luxury flats here. You’ve got this railway line here, you’ve got another railway line there, it’s a funny plot of land. And look at these structures aren’t they beautiful? Gorgeous, really gorgeous. That is an incredible structure. Yes, it is, it’s beautiful. I love it with people’s names on their plots. So obviously one family do you think? Yes, I think so, yes. 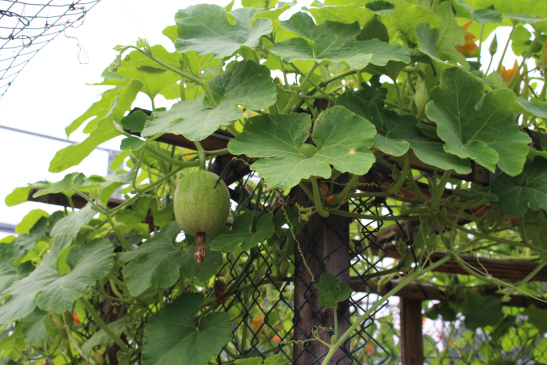 It looks like there’s going to be some cracking produce too. Oh yes, look at that. I’m not actually sure what they are. No, are they going to be gourds of some sort? Oh yes look, look at those. Oh yes, well it’s just spectacularly amazing. So, this railway arch I want to tell you more about, it was really important for our walk because, well, none of this was here, in fact very little activity was here. There was this kind of weird timber yard, but nobody ever seemed to go in or out of it, it was very strange. So, we really made use of the space, we would use it as a place to pause on our night walks, and we set up, inspired by the street drinkers actually, a brazier and have a fire and cook soup and popcorn. So there would be a meal on the night walks and then because nobody ever challenged us we got more and more confident [laughs] with doing things in the space. We did one walk where we set up a generator and screened a film and it really felt like wow, we can you just come here, and how extraordinary to find this space of possibility right in the city, and all you have to do is come here and do it. A play area, look at that, isn’t that wonderful, it’s fabulous. I think I’m going to bring my kids down here because we could come to the City Farm and come here. Yes, you can sit in a coffin. Recycle your clothes. What a treat! And so close to the city too, we’re a ten-minute walk if you walked directly from those luxury tower blocks of flats going up to here, it is probably ten minutes away, it’s like another world. This old railway line was contentious in its day too, I think that was 1860s, 1870s the line was built to bring people from the new suburbs into the city and so before that, well there were like ten or fifteen streets that crossed here and they were replaced with this one crossing. 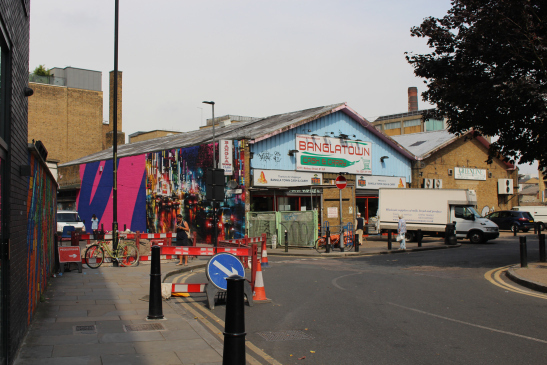 It created this rift in the landscape between the Bethnal Green side and Whitechapel. I did quite a bit of research looking at historical maps trying to work out if this bit of land had ever been built on or if it had always just been this accident of city planning that had remained empty, and I found there were streets. 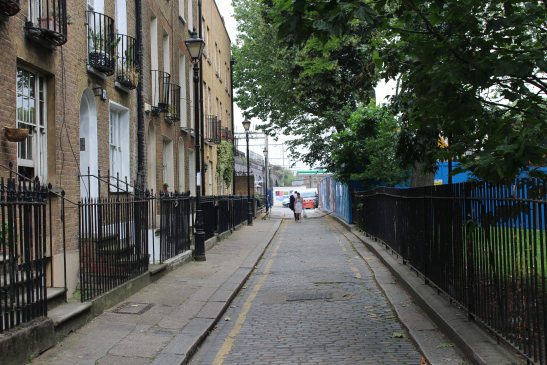 The First World War bombing destroyed the streets, leaving these spaces behind. This arch was where we would have the walkwalkwalk fire normally and you can see the church on the other side, so this went straight on through where that railway line is now. You can see some amazing architectural follies here too. I don’t know if they’ve been placed there for people to look at out of the railway windows. 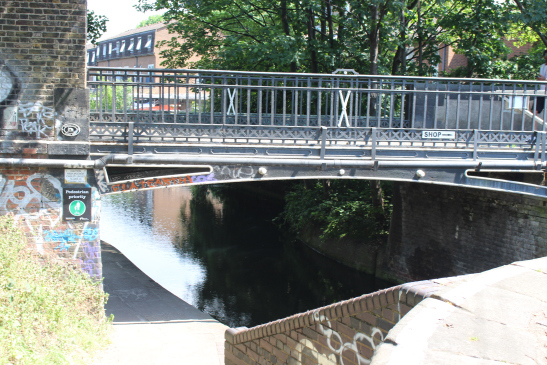 And then this footbridge is quite amazing too, it really does feel like a kind of passing place. So when we first sent people on this walk from the conference on their own with a map we felt really nervous about sending them over this bridge and we almost considered coming and cleaning it [laughs] beforehand but we didn’t we just thought, no it was OK, sometimes it can be really foul there, but it is, I guess, it is what it is. And if you’re very tall you can see them, but if like us you’re not you get the feeling and the sound of the trains going underneath, that you are in this portal. It is, absolutely it is, it is it’s a gateway, isn’t it? There have been so many gateways. Oh look at that, Welcome to Heaven and this is interesting as well isn’t it. Oh, it is metal made to look like rubber to prevent people trying to get over this. Yes, it would be interesting to know the history of the Nomadic Garden. Yes, yes absolutely. And I wonder who the activator has been there and what a great thing to do. Actually, it reminds me of the Stalker Group in Rome, do you know them? They’re an architecture collective and they do a lot of walking. I went at Easter and did a three-day walk with them which was called Out of Contemporary. It was a walk through the ruins of Rome and we began in the centre by the Colosseum and saw lots of Roman ruins but also they took us to contemporary ruins, it makes me look at our Olympics and think what a great, un-corrupt, successful project basically, despite my reservations, because in Rome, this Santiago Calatrava structure that cost six hundred million Euros is stood there completely empty and deserted, unfinished and oh, just site after site of these spaces. Stalker have also done a really amazing project with I think mostly Romany people who have been squatting at a site, quite near the centre of Rome. 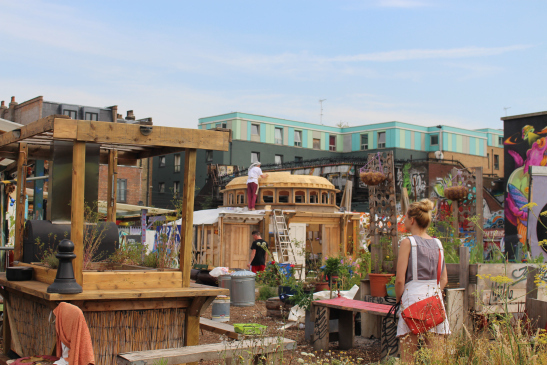 They work with the community to activate the space and get people to work with their interests to grow spaces and gardens, using their architectural skills to build structures. 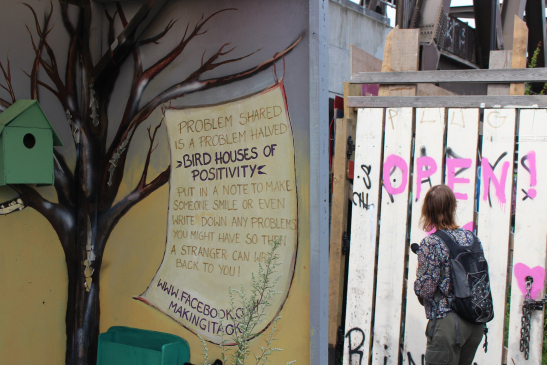 A really participatory project, facilitating a sense of community and ownership in quite a temporary space, and while I was there it was looking like they might be allowed to stay. 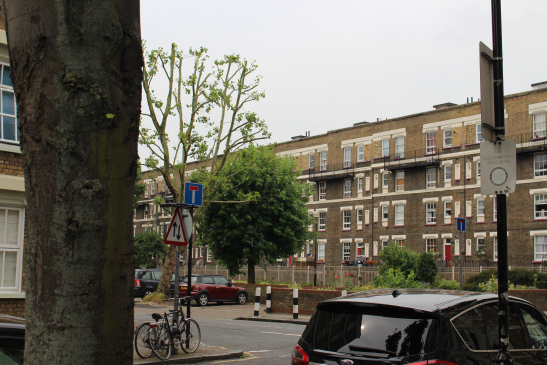 There are cherry trees here look – they are all over Bethnal Green. It’s been quite a good cherry year but they’re mostly infuriatingly out of reach. It’s very welcoming to walk under them. I tell Clare that for me these walks are also about both holding and managing research themes and at the same time a space to just be for a while as well. Yes, it’s such an important thing to do. When I finished the AHRC project, the Walking Artists Network project last May and I had the email that said right, what’s next? So is there another bid that’s come out of it? Yes, that’s right, I know, I know, hurry, hurry, hurry. OK, so what are you working on next? Are you writing something else? and you know what I said to them? I’m not even going to think about what I’m going to do next for a year, I need a year to think about it and I need more than a year actually because to make good work I need time to think about it. Absolutely, absolutely and time to think is something we need and rarely get and you can get stifled, your creativity is stifled. It is stifled, isn’t it, when you are overloaded? Yes but I think what I find heartening is the potential for collaboration and if you can find ways to work out the time to write the funding bids, then you can do great things. They open up possibilities. Absolutely and you can create space. You can do amazing things, and what a privilege already to have in this job, to go to Rome for three days. Or to spend a morning walking with you. So this is Weavers Fields and this park is now actually closed at night but it used to be open at night and it was street lit but somehow these streetlights that go along the path used to make the darkness much darker, so you’d have this line of light, but then you’d have the darkness all around. There would always be a group of young guys and I never had a bad interaction with them but they were a little bit frightening because they weren’t sitting on the benches on the lit path, they’d be in the dark bits, and you’d hear them whooping and running and sometimes with mopeds, kind of ripping up and down in the dark. So this always felt like an intimidating space at night; their presence and their ownership of the space felt like it was theirs and no one else’s. Sure and then you think of the risks, don’t you. You think of the ‘what ifs’ or the potential. I wouldn’t personally walk through a park after dark anywhere. I know, we’re framed by our understanding of what happens in spaces aren’t we? 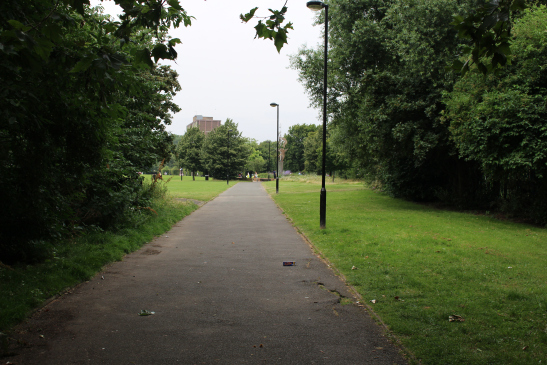 I walk across London Fields, my local park at night, but it’s very small and you can see and it’s busy as well so there are people around but that’s the familiarity thing too, isn’t it? Clare pointed out some housing from the Four Percent Industrial Dwellings Company. I think these workers’ dwellings are from the Four Percent Industrial Dwellings Company, investors could get a four per cent return, which was a low return because their money was being put to philanthropic use to build good quality housing for the working poor. These might not be Four Percent but there are lots of Four Percent Industrial Dwellings around here. So we’re well into Bethnal Green now this is proper East End, or what I think of now as the near East End because now I work out in the ‘far’ east [laughs]. Yes, so this road runs from Bethnal Green Tube which we’re coming up to on the corner all the way down to Bishopsgate, right back near where we started. 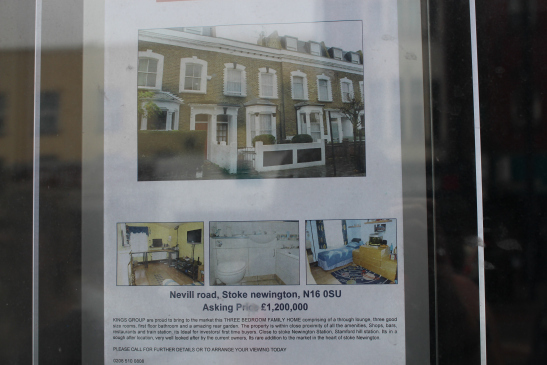 We passed estate agents and shared our horror at the prices of house ownership and the housing crisis. One point two million. These are completely prohibitive. Or for rent look. Three-bedroom house for three thousand, almost three thousand pounds a month. OK, so we’ll cross over and go up this way. Oh my goodness, that’s, oh we’ll have to walk down there where that digger is, it used to be like a four storey building. Until earlier this week. It was on our route because this little alleyway here that we’re going to go down. So the building had a sign on it, I think there must have been a church in there, the sign said ‘I Am The Way, The Truth And The Light’ and it looked like it was pointing this way. 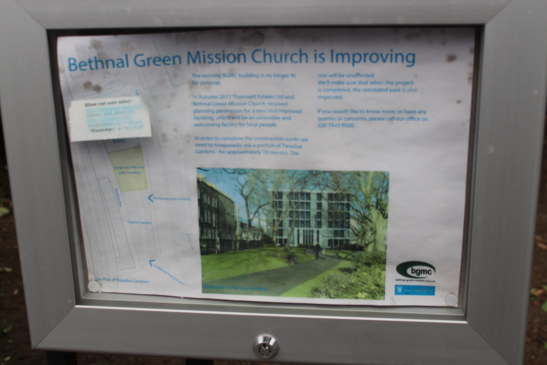 OK well, at least it’s being knocked down to build a new one, not luxury flats. Let’s walk around the back of it, but yes, well if you’re working out a walk route and you see a sign that says ‘I Am The Way, The Truth And The Light’ you have to walk down that street. They’re amazing houses, aren’t they? There are bars in the arches. 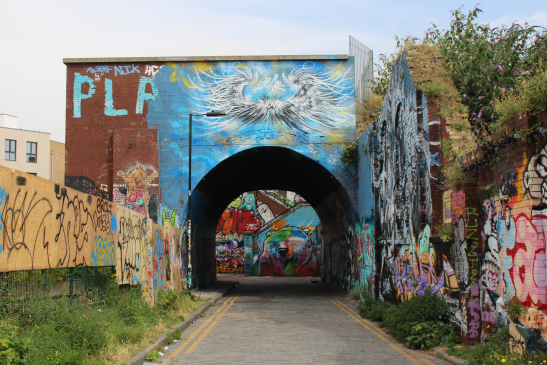 So the arches have all been converted along here. And this might have to go on the things that have gone list. And then that’s the Museum of Childhood just behind there. OK, it’s a bit of a surprise to see a garage. Yes I know it is, they always feel incongruous to me right in the city. 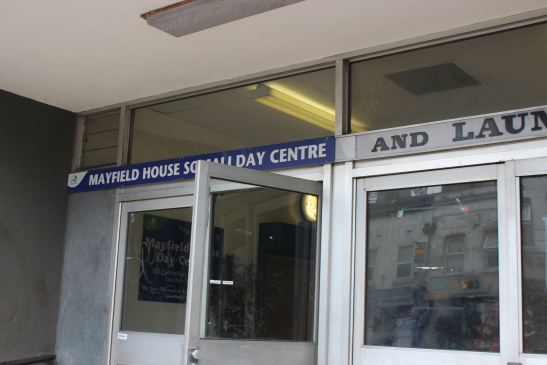 So let’s cross over here and I’ll show you the ghosts of Mayfield House, a coin-operated automatic laundrette, sadly no more. 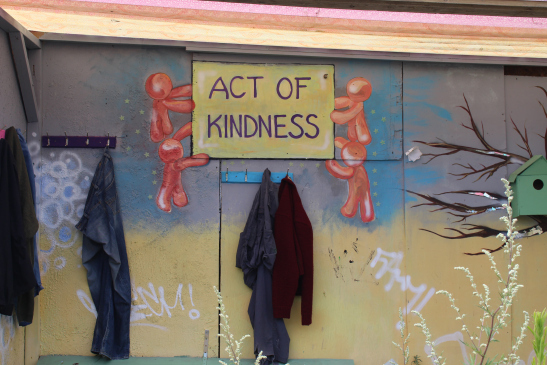 There are little pockets of launderettes in London and it’s a kind of vicious circle, basically if one closes then if there isn’t another one nearby people have to buy a washing machine and then once that happens then there’s no need for a launderette. Whereas in Shoreditch there’s a Youth Hostel and there’s a launderette just next door to it and that seems to do a roaring trade. Or you know on big estates if there’s one I guess then people are accustomed to it and they need it, but there was an enormous one behind these windows. For a while, you could still see the signage but I think they’ve erased it. It opened in 1960 and we found this amazing newspaper article of when it opened, it was written by a man but it was this, like, open to the new technology ‘now the housewife of the East End has the pleasure of relaxing whilst her laundry work is done’. Yes, and hang it up in the morning, yes. I put on a load when the kids get up and I hang it out before I go to work. Yes, yes so you squeeze it in but you no longer dedicate time. Yes, but we don’t feel the benefit of that time saving any more do we? Bethnal Green town hall now a luxury hotel and apartments. This is the most beautiful extraordinary municipal building, we’ll go inside. It was extended in the 1940s and the foundation stone was laid 1909. OK so still they might have taken a long time to finish it, but it’s just stunning. It fell into disrepair for a long time and it was used for filming because its interiors are so amazing, so a lot of Hollywood films were shot in there. And then this developer came in with a proposal to rescue it and it’s a hotel, yes. 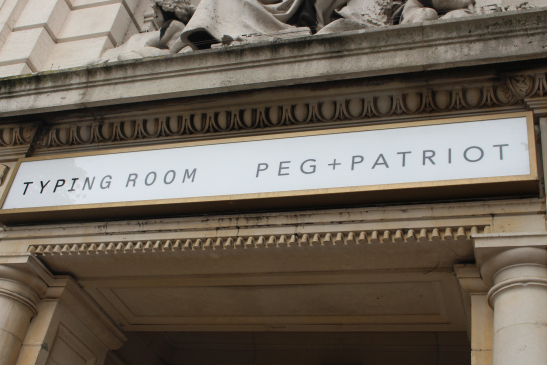 The restaurant is called the Typing Room and the Peg and Patriot is the bar and then the hotel entrance is around the corner. So part of their planning permission was to commission artwork from local artists, so walkwalkwalk have a series of text pieces in here. I’ll just show you one or two because they’re all around the hotel but I mean even if we just go into the foyer it’s stunning. It’s absolutely huge, isn’t it? It seems to be doing very well. I mean it’s crazy exclusive. This is the Blind Beggar of Bethnal Green on the entrance here, it’s a very odd story It’s about a beggar who manages to amass an extraordinary wealth from his begging and has a very beautiful daughter who he then manages to secure a successful marriage for. At the reception, there was no problem in us having a look around. Hello hi, I’m one of the artists who has an installation here and I’ve just bought my colleague to see it, is that OK? Isn’t it beautiful I mean just the marble is stunning? Again there are newspaper articles in the local archive detail where all the different marbles are from. 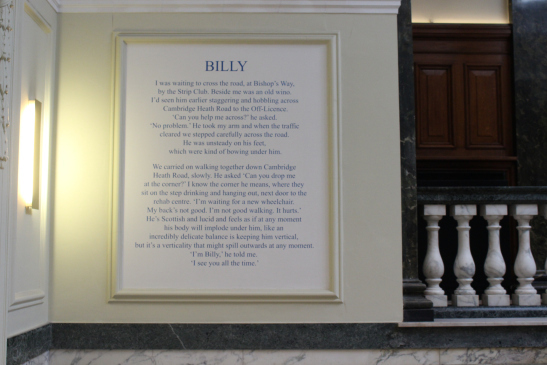 So this is one of our text pieces: Billy. Billy is a street drinker who is now embedded into the wall using a plaster lettering technique which is quite amazing. So our idea was to make the contrast between this luxury space and the reality of outside. This is stencilled in plaster so it’s actually part of the building, this is plaster and then this is a coloured plaster that’s laid over the top with the lettering. It’s nice to come and have a visit with them actually, they’re looking in good shape. 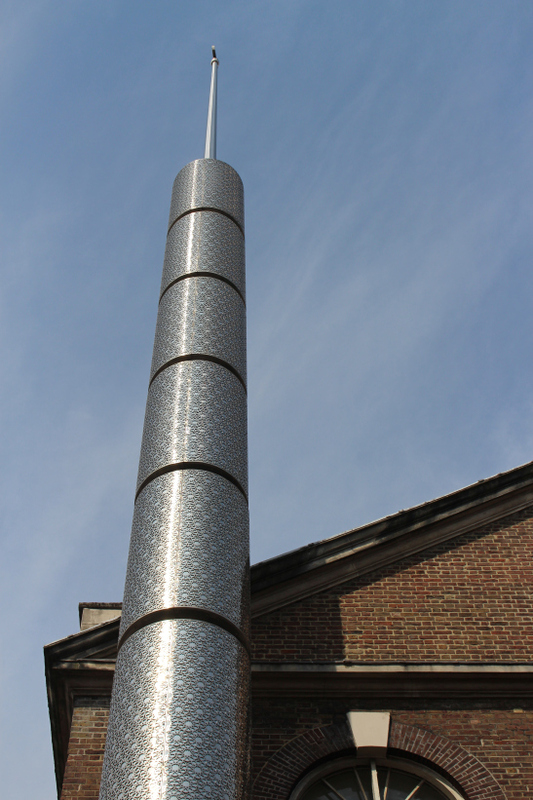 The commissioning process was managed by Arts Admin who is based at Toynbee Hall, they were employed by the developer to commission and curate the work. It was really interesting to try and work with things that would speak to the environment so like the little red sign you know, is trying to use the language of signage that you might see in a hotel. So they’re designed to blend in basically with the vernacular of signage of the hotel. Yes, well and in some ways I mean I know it’s an exclusive type of space but if you say I’ve come in to look at the artworks they’ll go ‘yes, of course, you can’, you’ve got to look right though don’t you. It’s not a public space, though it might feel accessible to us. Yes, yes absolutely, Billy wouldn’t get in. So this was the start point for the night walks, we used to meet on this corner. 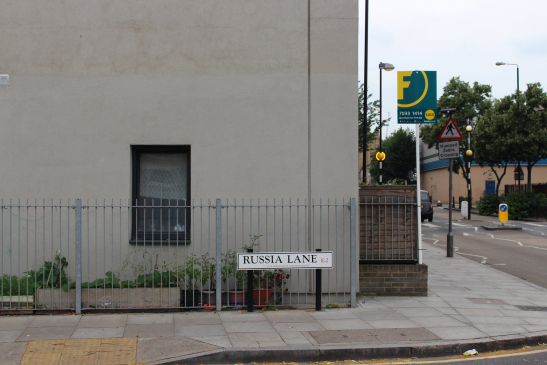 Yes and Russia Lane, yes and now it’s flats, everything is flats. I don’t know, it’s like where do people work? 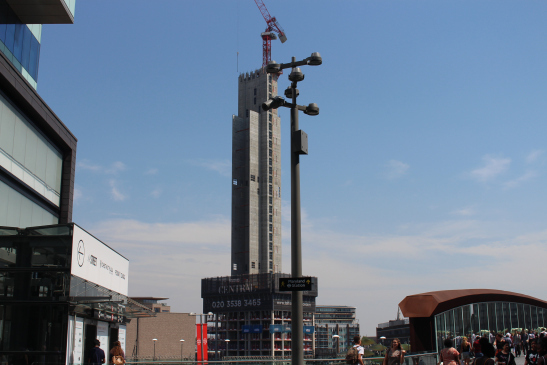 Do you want cities to be not just dormitories for the centre? I just feel like it’s the pursuit of the money again, it’s the ‘where’s the money’ question and a light industrial unit isn’t providing it. No, those people were paying whatever rent a month, compared to the value of the land for residential property! This would be our meeting spot because mine and Gail’s studio is just down there, I never really go there at the moment, I’ve forgiven myself for that as well. It’s cheaper than hiring a storage unit for all the stuff that’s in there. So yes, that would be our meeting point and we’d gather there and then we’d walk. 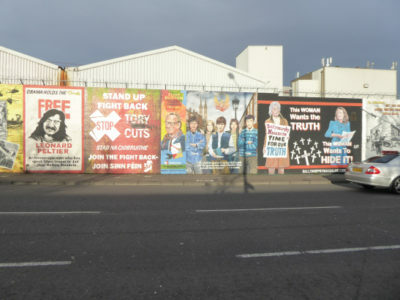 So we’re reaching the edge of the walkwalkwalk route and this used to be a light industrial estate with a most amazing high, red wall around it.it had things like a Russian supermarket in it. 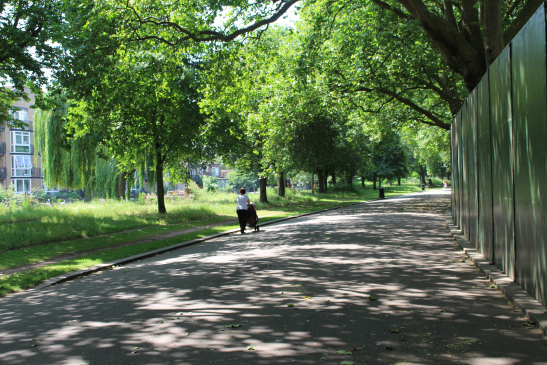 Victoria Park, it’s really lovely, it’s kind of lung shaped and it’s often called East London’s Lung. Well, I think it was built with that idea in mind as a respite for the people. She does these amazing long distance walks, she walked from Barcelona to Paris for the climate protests last year. We’re also working with Invisible Edinburgh, a homeless organisation in Edinburgh to do a walk for us in the evening, Rosana Cade who’s a performance artist who made this fantastic piece called Walking Holding is there too. Morag Rose is from the Loiterers Resistance Movement, she’s just launching this enormous project at the People’s Museum in Manchester, something like twenty-five events and forty artists and all through the summer walks and a big programme. We stopped to look at park workers clearing the weeds from the lake. I tell Clare that I love her London! Yes, it’s a very nice part of London. 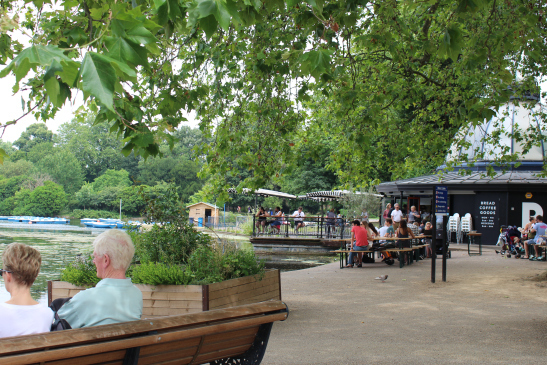 We stopped for food and that sparked a conversation about eating out in London. I do feel very lucky, it’s improved massively in the last ten years but I now realise when I go back to Winchester, where I grew up, I just can’t believe how expensive it is to eat and it’s all chains. I’ve got nothing against Pizza Express or Bella Pasta or anything like that, but when we can go to our local café and have a fry up for a fiver and I just feel in London there are a lot of places where you can actually get a pretty good meal for a fiver. A couple of years ago I did a site-specific project with students at Hoxton Hall and we had such a good time and one project was about all the food, the different global foods on Hoxton Street, and my student made this banquet in Hoxton Hall and got people to talk about where their food culture came from. Hoxton Hall is an old music hall and it’s really beautiful, and you wouldn’t know it was there it’s so tucked away, it’s really lovely. This wall here is a border. 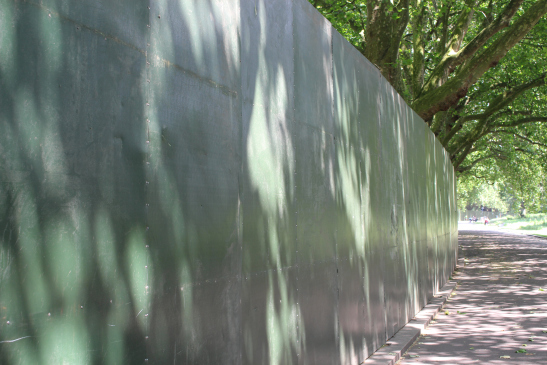 So all summer long there are festivals in this part of the park and this dark green barrier is meant to somehow make it blend in a bit, but it’s quite disruptive, I mean we’re in Tower Hamlets now that’s the borough that we’re in. I think they need to do more work to show people what they’re doing with the money that it brings in to benefit the park for everyone, because otherwise it just feels a bit like a barrier with obnoxious music behind it, blocking our park. We are on the edge of the canal and the edge of the park. 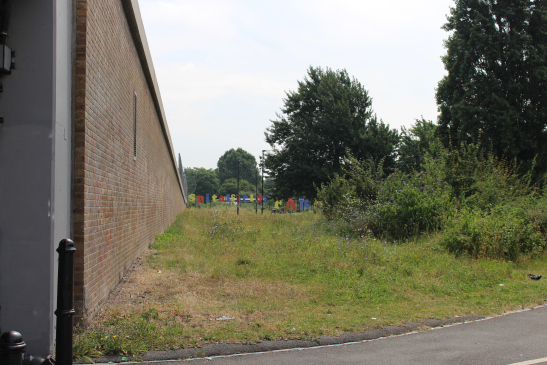 Housing development, ‘community’ and the community levy. 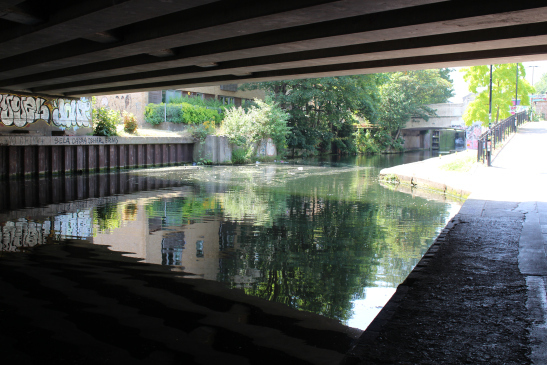 How lucky people are to live in these spots by the canal. Absolutely gorgeous. Yes, here we go, look so this festival was on last weekend, it says it would be cleared by Friday twenty-second. Wow yes and look at the size of the festival, look at that, it’s huge! And it’s right in the middle of a residential area, I know there’s the park as well but gosh, I’m not sure I’d be, it sounds a bit bah-humbug doesn’t it but I think if I was living over there. Yes I know, would not be happy. Yes, it goes on and on. Gosh, they look very exclusive, don’t they? I hope some of that is social housing. I know that’s what I don’t understand at the moment. I suppose the blooming Tories just wiggled their way around that didn’t they, the requirement for all developments above a certain number of units to have social housing. Actually we did a really interesting interview with a guy who worked in strategy at a local Council who was telling us about how they had these two big blocks of luxury flats go up and the community infrastructure levy that the developer would have to pay was set at a certain level of occupancy so once there were more than sixty percent occupied or sold then the developer would have to pay this tax to the local council and to avoid paying they just sold to that point and stopped. So they’re just sitting there with the forty per cent of the development empty so they don’t have to pay their community levy. These bastards who are just strategizing their way around any attempts to get them to contribute, it’s awful. Also, he was saying these luxury flats are one and two bedroom flats, so the council considering the planning and everything have planned or imagined that they would be couples, single people or maybe people with one child and he was saying ‘they’re not’ ‘they’ve got one bedroom flats with families of five living in them’ and so the impact on local services is enormous. He seemed like a very reasonable guy, but he was saying we want people who just sleep here, get up and go to work… otherwise it’s too expensive. So no community. It’s a really scary future, isn’t it? It is, yes, yet how can families be so undesirable when surely in long-term economic thinking we need children, they’re going to pay the taxes. I’ve had a few people say having been in other parts of the country that it feels like a relief to be here, since Brexit, even though racist incidents are up here too. Yes, just the level of diversity here makes it feel a little bit safer. I think we should cut down here on to the canal path Maggie because it’s a really beautiful little snippet. 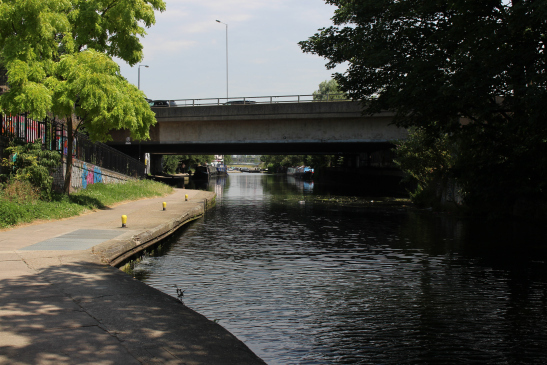 Well, it’s really interesting because it’s another border, so as Victoria Park runs out we kind of go round to Hackney Wick which is this light industrial zone again. I think people thought it was going to be more gentrified during the Olympics than actually happened, but it’s definitely really changed. We passed a cycle hire section on the side of the grass. They look like they’re designed for people with all different types of physical mobility needs, don’t they? 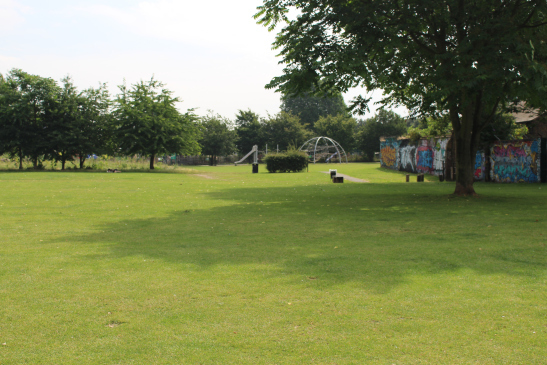 It’s such a lovely park, it’s got two beautiful playgrounds as well, enormous playgrounds which are great but, if you’re ever thinking of bringing more than one small child there make sure you go with someone else because they’re not fenced, which is a bit of a challenge. Yes, it’s a beautiful path. It’s a lot of work living on the boats because they have to keep moving. Last year I remember my friend Simone saying that they were having to move every two weeks and it’s a day’s work every two weeks to move. Yes and I suppose it depends on how far you have to go as well because it’s not fast. I really love the idea of it I have to say. It’s just incredible, they’re water houses. Yes I know, if it were me I’d have a little boat I think just to potter on. I would definitely be sitting there reading. A lovely little garden centre. So it might seem strange to say that I love this space but there’s something about this. This, where the road goes over and somehow it makes the light reflect in the canal underneath the road in a really beautiful way and I love the sound under these bridges too, but this feels like an edge to me this feels like a kind of boundary. 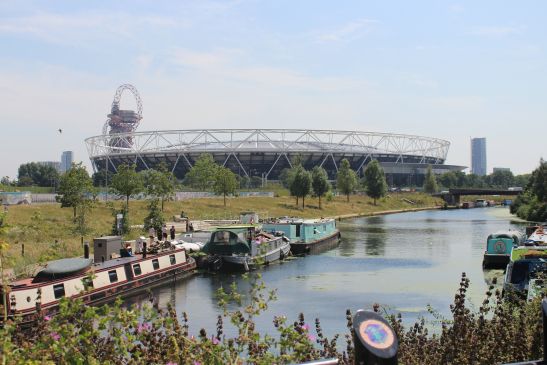 Olympic Park: edges, railways and canal. 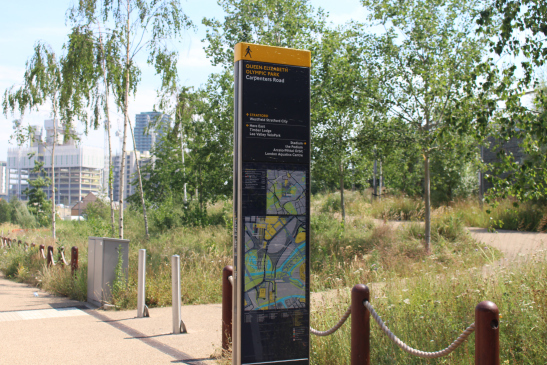 So this is the edge, so this is the Olympic Park, this way you can see the luxury tower blocks coming from that direction as well. This is where the blue fence ran, along that side of the canal, and then this is one of the first roads that re-opened into the park. 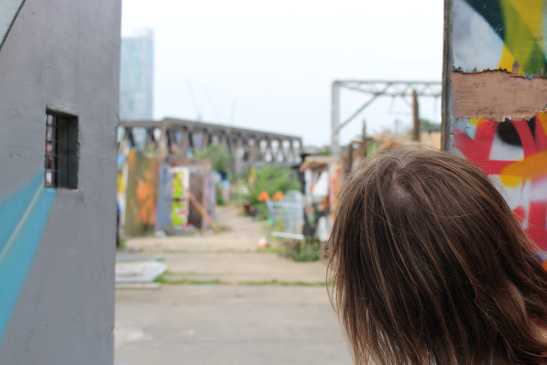 So yes there’s Hackney Wick on that side and we’ll wind up in Westfield. With John Lewis directly in front of us, a massive John Lewis. Yes, this huge John Lewis, huge Marks and Spencer’s, it’s got a huge casino in it, it’s just It’s monstrous. You have to go through it to go to the Aquatic Centre, so we sometimes take the kids swimming at the lovely Zaha Hadid swimming pool, that’s post-Olympics. A leisure social enterprise runs all the ex-council swimming pools in London; three pounds eighty for a swim and how good is that.. but you have to go through Westfield to get to it from the station. We should go up here to get across. So again this is kind of crisscrossed with railway and canal and the so this is the River Lee now that we’re coming up to. We’d like to go across that bridge but I think there’s another one just there. 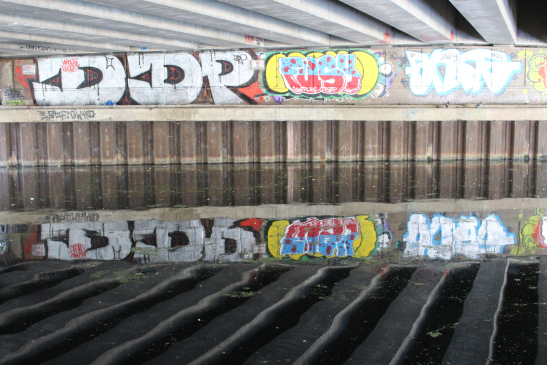 Actually, this is a rather beautiful mirrored bit under here, the underside of the bridge is all mirrored. It is, yes there are some really lovely things about this space, despite my ambivalence about the Olympic project, and I have a lot of respect for the arts and culture team. Adriana Marques who worked for the Olympic Delivery Authority in the run-up to the games, commissioning artworks, now works for the LLDC, and I’m really impressed that she hasn’t shied away from commissioning things that are challenging – not things that explicitly criticise the Olympics, but that at least present multiple voices. 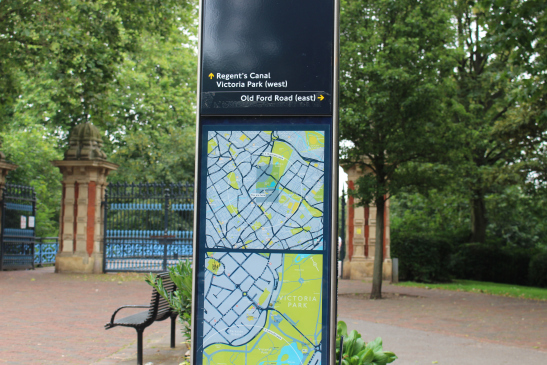 She commissioned Lucy Harrison to make a piece called Mapping Your Manor which was an audio walk around the perimeter of the park when it was still closed off, gathering local voices, local perspectives, many of which were critical. They’ve also run this scheme called the local programme which commissions organisations who are based on the fringes of the park to produce cultural events here and it’s all about bringing people on to the park, that’s the goal, bringing in local audiences. In fact, they commissioned my East End Jam project. Clare’s East End Jam project involved going for a walk with Clare and learning about and foraging local fruits, berries and edible plants and then making them into jam in a community kitchen. So I did a jamboree for them last September as part of their Harvest Festival which was really good. Yes, there’s something so simple and so fabulous to pick fruit on your walk and make jam, share that jam, eat the city. But there are bye-laws in place on the park itself that forbid picking. I would really like to do a bit more work and a bit more research on it. I’ve chatted with a couple of colleagues at UEL in law about it. Bye-laws are rules that are sometimes in force that stop people from doing things, that fix a kind of culture of what is and isn’t allowed. So maybe I need to find town planners or council planning people to talk to, or the parks people you know, park administrators? I don’t even know who they’d be. So the fruit is not yours freely to do pick, use and share? I know and I did talk about it you know because the specific wording is that you shouldn’t remove it, the berries, the fruit. I did say what if we set up like a mobile jam making station and we pick the fruit, make the jam and eat it all in situ, are we all right then? So they kind of hummed and hawed over that. Clare spoke about the number of free and open spaces in this area, the Aquatic Centre and the swimming pool. Yes and look there’s, is that one, two, three, four new blocks, four new massive blocks going up. Yes, do you think they’re shops or accommodation? So if we cross over here we’ll just do one last border into Westfield. This sign made us both laugh and also feel quite melancholic about the future of culture if this was it whilst the creative culture of picking fruit and berries growing in spaces owned by no-one and making jam was outlawed. We ended our walk at the station in Westfield and took a tube together to visit Counterpoints Arts in Hoxton. I thanked Clare for walking with me, it was such a pleasure walking with her! 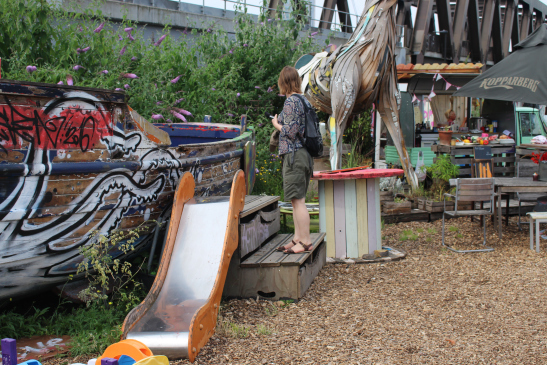 Seeing her London and connecting to the issues that emerged from our connection with the sounds, spaces and pace of the areas we walked in and through was a rich, mobile and relational experience. 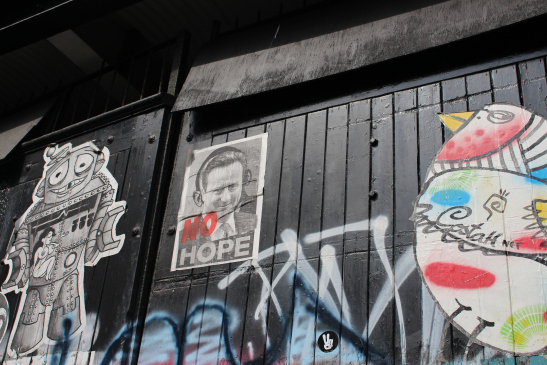 On the journey to Hoxton, we reflected on a number of key themes that emerged for both of us during the walk. 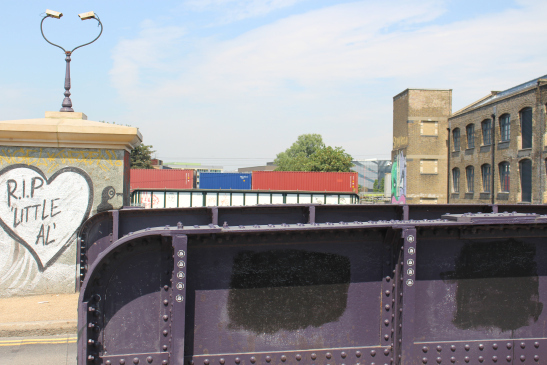 At the start of our walk, Clare had said that here walkwalkwalk project set out to explore familiar places and they found that the project was also tracking the changes happening in the city, especially around the introduction of the East London Line Rail extension. This was to be a theme in other London walks too. Clare’s walking arts practice was a strong thread through our walks, and her various projects were knitted into the conversation and experience of the walks : the walkwalkwalk night walks with women; the perambulator walks in Scotland; the jam walks in the East end; the walking artists network all connected to her biography, both as an artist and her autobiography. Fragments of Clare’s life stories are mapped out along the route in relation to her studio, her work at the University, her children, family life and negotiating the various every day and remarkable paths and routes she walks as a mother, artist, academic, researcher, teacher and leader. 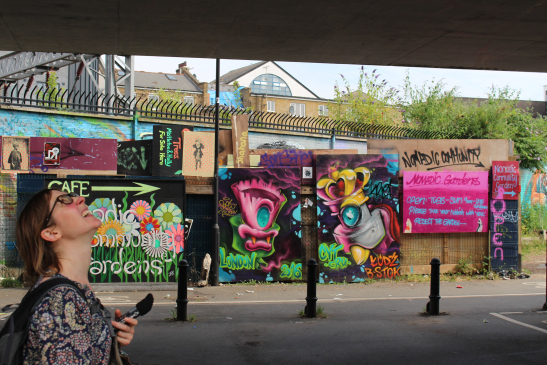 In the journey to Hoxton and later on we reflected a little on the themes emerging from our walk. 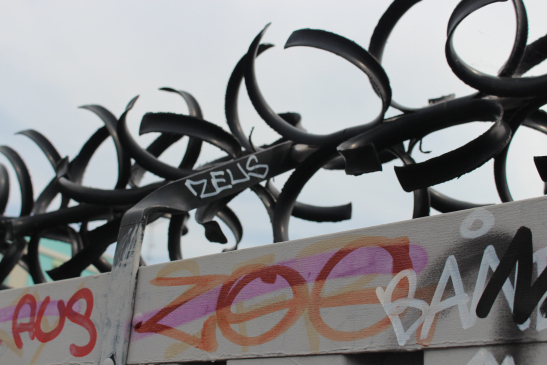 Spaces in between Borders, edges, boundaries, thresholds and portals. Sometimes, as in the blossoming of the nomadic gardens, this was because space was literally left over or an accident of ‘planning’. Ghosts: Things that are gone, emerge and are resonant in Clare’s current and previous work, so examples on our walk were the mission church, the launderettes, wash house and the town hall, now a posh hotel and the demolished buildings that we met along the way. Darkness and light, especially present in the cut-out spaces, the strips of unlit land, the railway arches, canal underpasses and bridges. Safe spaces and risky spaces. 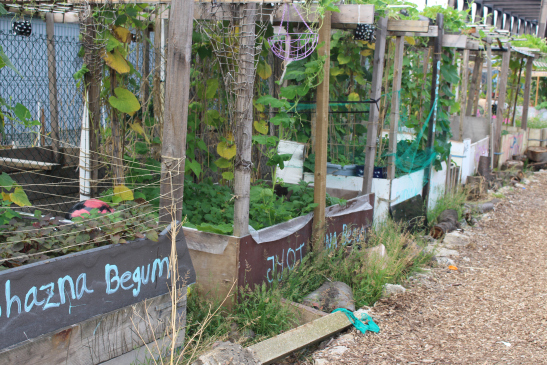 Sometimes these spaces are transformed by the brazier’s, people going about their everyday lives, creating gardens, walking in these spaces, or walking women taking hold of these spaces with prams and children, setting up generators, projecting film and cooking and sharing food. Acceleration, Pace and Sound We spoke about acceleration, pace and slow in the landscape and cityscapes as well as in our lives within academia. And how tough it is in current times in the University with the audit culture (REF and TEF) that creates a pressing desire and need for slowing down the pace at times, to process, to reflect, mull, germinate/ boil down thoughts, ideas. The time and space needed for creativity is brought into high relief. Time and Space We reflected upon the decelerative and accelerative moments in our everyday lives and the pressure to do things fast: funding bids, turnaround one project and start another and the overwhelming expectation of speed not slow. Yet, in the walk, we were able to connect to the mobile nature of our lives in ways on the move and share in a reflective space inspired by the sensory dimensions of the places and spaces we walked in, through and with. Dwelling What is it to live in London? 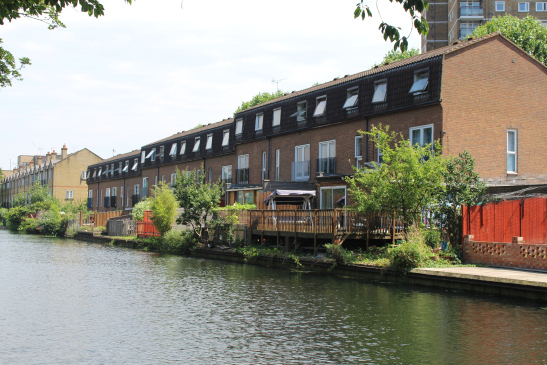 in the flats, newbuilds that only 60% occupied to avoid the community levy, the luxury apartments, canal boats, canalside, in a nomadic garden or around a brazier under a railway arch. The wave of accelerative capitalism constitutes a de-humanising force symbolised in the surplus value squeezed out of the 60% occupied flats in a time of housing and homeless crisis, where the singles or couples return after their own surplus value has been extracted, offered or exchanged. Moreover, the lack of infrastructure to support ‘dwelling’ as housing developers appear to want ‘automatons’, who are really present to eat and sleep, returning to, from their places of work. The Dwelling we experienced in the nomadic garden, the conviviality and life happening all around was lovely to experience. In an article on dwelling, building and space Heidegger describes how dwelling ‘unfolds’ and that ‘Dwelling’, “is the basic character of ‘Being’ in keeping with which mortals exist.” Dwelling and being in this sense and in our walk raise the concept of boundaries. We are attempting to trace in thought the nature of dwelling. The next step on this path would be the question: what is the state of dwelling in our precarious age? On all sides, we hear talk about the housing shortage, and with good reason. Nor is there just talk; there is action too. We try to fill the need by providing houses, by promoting the building of houses, planning the whole architectural enterprise. However hard and bitter, however hampering and threatening the lack of houses remains, the real plight of dwelling does not lie merely in a lack of houses. The real plight of dwelling is indeed older than the world wars with their destruction, older also than the increase of the earth’s population and the condition of the industrial workers. The real dwelling plight lies in this, that mortals ever search anew for the nature of dwelling, that they must ever learn to dwell. 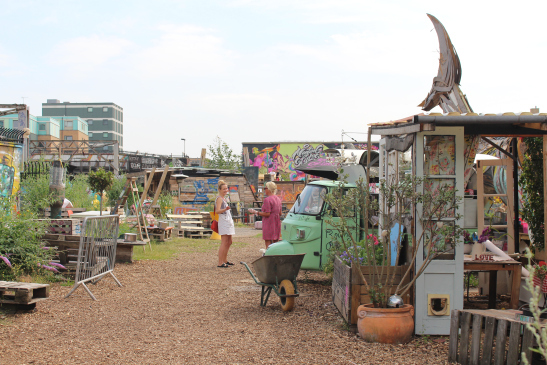 The nomadic gardens is a wonderful example of the nature of dwelling in the in-between spaces the gardens inhabits in our ‘precarious age’ a place where being and dwelling conjoin. Scale At the End walk at Stratford and the Olympic village we emerge from the canalside walk into the site and see the colossal buildings, the palace of consumption signposted by John Lewis and Westfield signage, the face and power of capital in the tower blocks, constructions and Westfield centre. From the start of our walk [at Aldgate East tube station where we witnessed the wave of construction erasing the smaller scale mixed neighbourhoods of Victorian architecture by capital and the site of London Metropolitan University] to the end of the walk, [ the Westfield Centre at Stratford and University of East London] we witnessed the cultural, social and political shifts in scale taking place in time and space. The aesthetics and texture of these shifts are as apparent as the feel of the sun on our skin and the aromas and sensory/visual pleasures of Brick Lane. As Clare had described at the outset when walkwalkwalk started their walks they were witnessing these shifts in real time as the East London extension line was coming. We were really struck when we first started walking at night even before we invited big groups of people to come with us by how the fact that we were not just on our way somewhere, changed the way we felt in a space… but the main thing is it’s a shift in mentality or psychology of your behaviour within the space, and through that process, really claiming it and feeling safe and I think then once you repeat that and nothing bad happens you really do start to feel safe and like you have a right to the space. 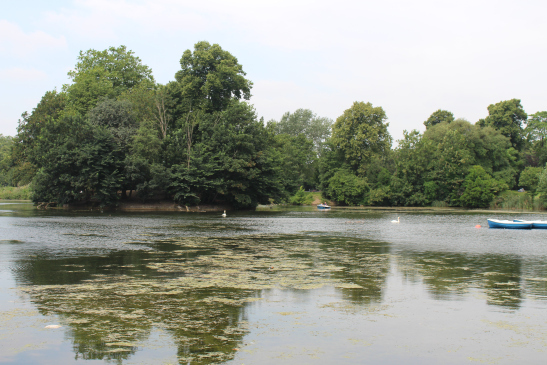 In the walk, Clare shared the nature of her dwelling, presencing, indeed her London. 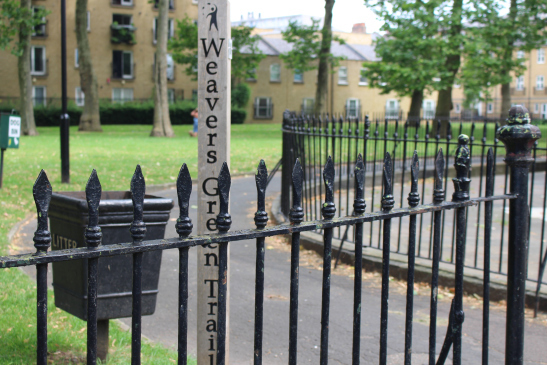 Fragments of her biography, her stories and creativity, the aesthetic dimension of her walking practice and its connection to politics and praxis unfolded in the relational dimension of our walk together. The relational sharing also elicited in part a biography of place that was both embodied and revelatory. 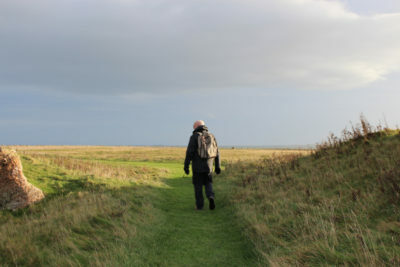 The walk elicited our appreciation, sense of belonging and connection to place, our sense of being and dwelling, understandings of community alongside the wave of the greedy capitalist machine, leaving little space for dwelling in its wake and the nomadic gardens and night walks as important ‘community’ antidotes. Previous article Walk 10. 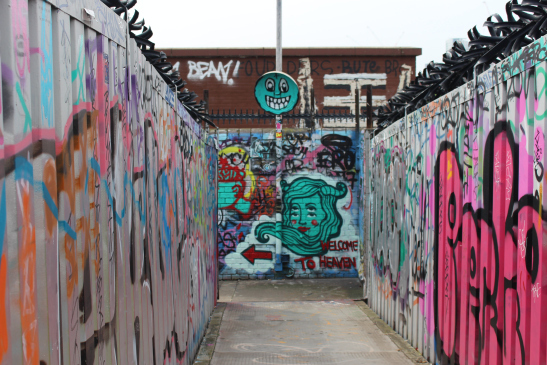 Walking with sociologist Linda Connolly in Cork.